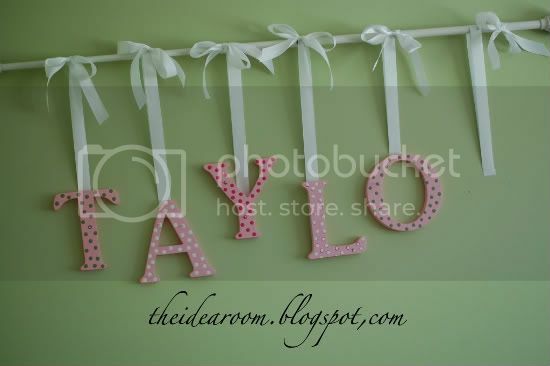 Want to hang your child’s name in their bedroom? This is how I did it for my daughter. First of all I bought the resin wall letters on line. I am picking my brain to remember where. I will update this when I figure it out. They were a lot cheaper than the ones from Pottery Barn and other stores. Then I bought a white curtain rod from Target. 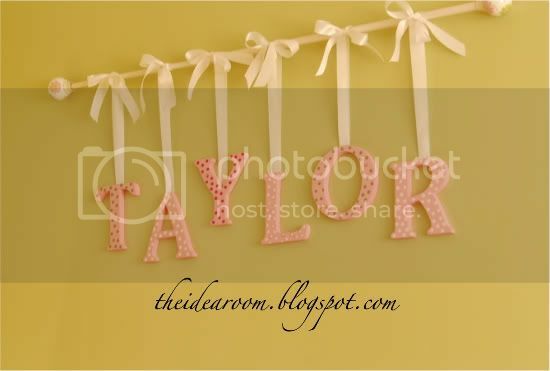 Lay out the letters and curtain rod on the floor and play with it till you are happy with the layout. Make your measurements to determine how you will hang them on the wall. We (yes, that is my handsome Hubs) measured the length of the curtain rod and centered it where I wanted it to go on the wall. Then we marked with a pencil exactly where it would be hung. Set the curtain rod aside. Take your resin letters and center the middle letter (if there is an odd number of letters in the name) or center the name between the two middle letters (in an even lettered name). 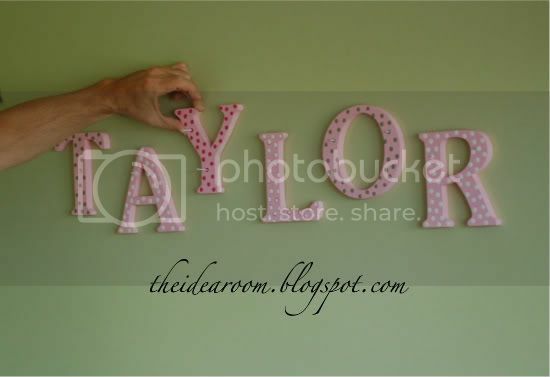 Hang the letters on the wall so that they are evenly spaced. I did not extend my letters all the way to the ends of the curtain rod. I wanted the curtain rod to be longer than the letters. Just play with it and determine how you like it. 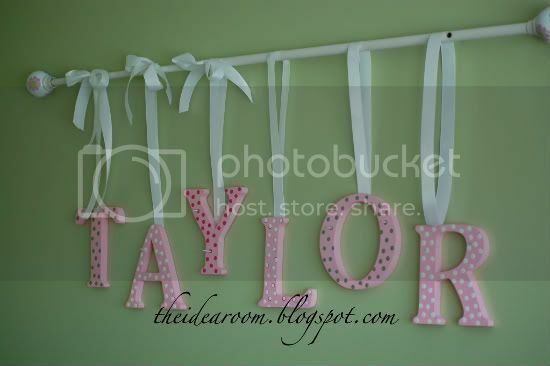 Now that the letters are on the wall, take your curtain rod and hang it on the wall. We did not use the hardware that came with the rod. We pre-drilled holes into the rod and then screwed the rod right onto the wall. This made it so it did not stick out to far from the wall. Take your ribbon and determine the length you will need to come up from behind the letter, up over the rod and back down behind the letter. You will want extra length to go behind the letter next to the wall. Do this for all the letters. I used tape to secure the ribbon behind the letters. (I know…high tech, but it works). Then I took another length of ribbon and just tied a bow around the curtain rod above each letter. It takes some adjusting but you can get the ribbon to look like it is tied from the same ribbon that is attached to the letter below. It worked out so that the ribbons covered our screw holes. 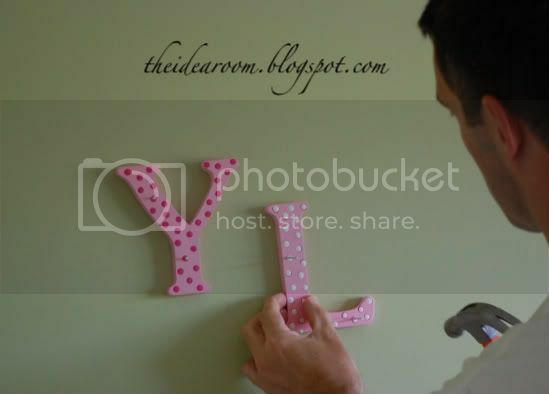 So be sure to plan for that by screwing the curtain rod directly over one of your letters on each end. If you don’t get it to work out, fill the screws with a little putty and then paint the same color as your rod. It won’t be perfect, but most likely will not be noticeable unless you look for them. That is all there is too it! *Edit–I remembered where I bought my letters from online. Click here for the link! « Reward Points System and Home "Store"
Cute! I bet your girl loved those pink polkadot letters, didn't she? LOVE it! Another great idea! I'm decorating a nursery, so I'm loving these sweet ideas that could work in a baby's room. Do let us know if you remember where you got the letters! I just found your blog from . . a different one, maybe UCreate? and I absolutely love it. I looked through everything and I even made the bathtub paint for my little guy to try today. So many great ideas. Thanks so much. I am excited to see what other ideas you have. Thanks for sharing. Cute (adorable even), but why nail down the letters? Why not just hang them from the rod rather than making it look as if you did? I do believe I'll be doing this one. Awesome! And I already have the letters!! The letters have P.J. Kids LLC written on stickers on the back of them. I know that is not where I purchased them from, but they must produce them. The letters are not wood, but resin. I am waiting on my bank to send me transcripts of my credit card since I purchased them in 2007. Hope that helps. Anonymous–I originally debated about that but I personally didn't like how they hung on their own. They were a bit off-kilter for my OCD. But if it doesn't bother you to let them just hang, then you can save yourself a few steps! Love them! Did you paint the polka dots yourself? What kind of paint did you use? Would like to do this for my granddaughter and grandson. How cute! I am sharing this on Pinterest.